Has it ever happened to you that you are so late to work that you could not whisk up something to eat? Morning hours are always action packed at my place. Every minute is important. However, some ready mixes make life easier. Instant Breakfast Mix is one such solution. You can add finely chopped cucumber, onion, tomato, coriander leaves and eat it like Bhel. In fact, thats how I came up with this recipe. I am going for a week long holiday and I dont want to give my one year old girl any train food. I am going to prepare this mix, moisten it with regular water and feed her at least one meal with this mix. You dont really have to use warm water, even normal room temperature water will work. Just that we all like to have food thats a little warm hence the recommendation. Mixing of ghee before eating is important because while roasting we have not added any oil. That makes the masalas settle at the bottom of the poha, not mixing well into the dish. Once you add ghee the masalas will coat the poha evenly, making it tasty. Add curry leaves, ground chutney dal powder and roast well. Now Add poha and continue to stir till the Poha is crispy. Add hing, turmeric powder, red chillie powder, dry tamarind powder and salt. Mix well. Dont cook much more as the masalas will settle at the bottom of the poha and get burnt. If you want to improve the taste (and reduce the shelf life!) this is what you can do. To the mustard seeds and curry leaves add some roasted and ground groundnut powder. Instead of tamarind powder use Amchur / Dry Mango powder. Follow the remaining procedure in the same way. This mix will be tastier but will last for about a week. Store this mixture in an air tight container. Use a dry spoon while taking it out. No need to turn on the stove. Just dampen the poha mix will some warm water and add a spoonful of ghee. Mix well. Be careful not to pour water in as poha might become soggy. 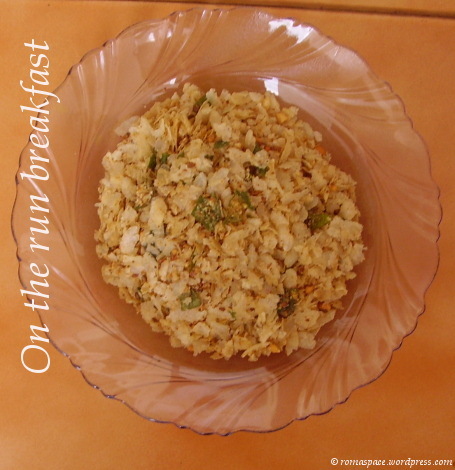 Hey loved ur fast breakfast nice one..
oh yes, we do need some instant breakfast ideas for busy days. and this is just wonderful idea. can use it like chat, snack and even breakfast as u mentioned. thats a great idea! I love your whole kids recipes section. Perhaps I can take this along on our weekend roadtrip. wow thats gr8…nice instant breakfast recipe. Wow, that’s one innovative recipe Roma. Quick and healthy too. This instamt breakfast is sure a boon to mothers. Thanks for the lovely comments. See you at the end of my trip, after a week. Till then, happy cooking !! wow..loved this idea. Will sure try it.